Air New Zealand is picking up international coverage of its “Happy Mothers Day” commercial, a tribute to the tribulations experienced by mothers of young children in planes. Children take turns to recite their lines from the poem outlining the challenges of flying, starting with using a handbag as a spew bag, screaming the whole flight long, frantic toilet runs, and crotches splashed with wine. Behind the cute children we see animations illustrating the ode to mothers. 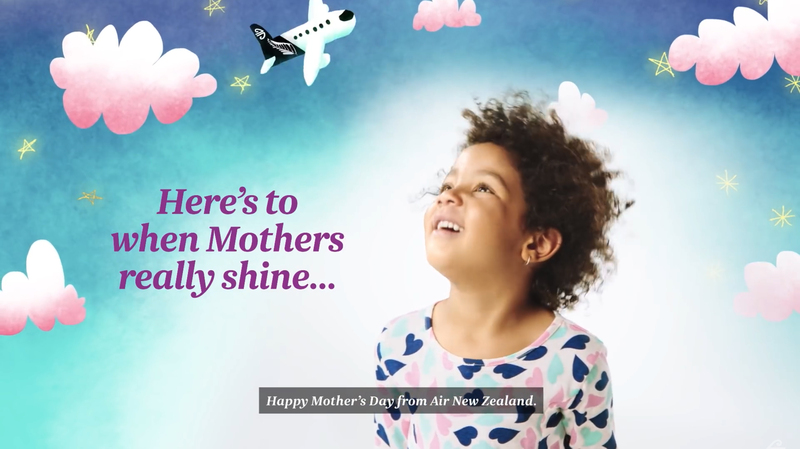 Air New Zealand General Manager Global Brand and Content Marketing Jodi Williams says the airline is celebrating Mother’s Day with a warm-hearted take on the inflight moments when mums really shine. The Air New Zealand Happy Mothers Day commercial was developed at Host Sydney by chief creative officer Darren Spiller, creative directors Jon Austin and Kirsty Gavin, copywriter Josie Burns, art director Matt Ennis, head of broadcast Kaija Wall, senior producer Eleanor Rout, managing director Laura Aldington, account director Jo Thomasson and account manager Andrew Dengate. Filming was shot by director Boca Ceravolo via Sixty40 with executive creative director Simon Robson, designer and animation director Fred Venet, director of photography Simon Higgins, animators Luke Carvell and Dom Aldis, editor Greg Constantaras, executive producers Bonnie Law and Will Alexander, senior producer Charu Menon. Sound and music were mixed at Song Zu.